Apprentice Game Review - Download and Play Free Version! Help This Poor Sap Become a Wizard! Funny Dialogue and Clever Story. Witty dialogue and amusing British accents by voice over actors. Difficult to figure out what items are needed to accomplish what. Possibly the shortest game ever - and if not among the top contenders. Small items needed to advance in the game are often too small and difficult to spot. A bit too much dialogue. Join the intrepid young apprentice as he sets out on a not so epic quest to collect the ingredients needed for his first spell. Explore a fantasy world full of wacky characters and experience all the elements of this endearing story. Built with the Adventure Game Studio editor, Apprentice plays out like the classic Lucas Arts adventures of old. 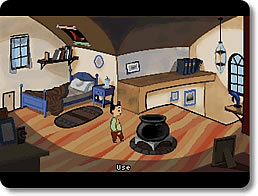 You navigate the various scenes simply by clicking your mouse and search for various items to be used in your quest. Dialog is handled through the use of dialog trees and the full voice acting really helps to draw you into the story. Although there are some slight control issues, such as not being able to right click to alternate between actions, the inventory system is rather well implemented and fully compatible with the fantasy setting. With quite a bit of humor and some minor in-jokes, Pib's comments are sure to put a smile on your face as you meet a variety of quirky characters and scenes. 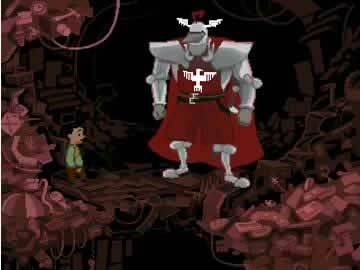 The incredibly high production values help to draw you in and are reminiscent of the classic point-and-click adventures of the past. The music is very good, the cartoon style graphics are excellent, and the game is full of detail with nearly everything being clickable and verbally described. Put some of your problem solving skills to the test as you try to decipher the various inventory based puzzles that you'll discover on your expedition. If you really get stumped, there is always the typical adventures' "try every item in the inventory on everything" strategy. 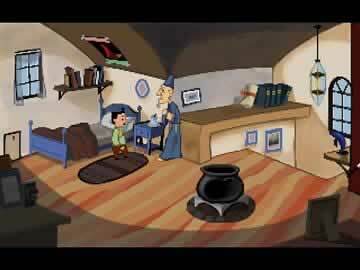 So if you are a fan of old style point-and-click adventures, download Apprentice and start Mortimer on his travels today! Congratulations, you are about to begin playing what may win the award for shortest game ever – at least in terms of tasks to complete. Upon reaching the finale of Apprentice it will be quite shocking to realize that you have just watched the final cut scene and have reached the credits. The reason for this is just how little actually must be performed in the game. Once you understand the course of the game it can be beaten in mere minutes and for this reason all players are hereby forewarned to avoid using online walkthroughs as they will eliminate any and all challenging elements of Apprentice. That said, although the actual amount of work to complete is relatively limited, it will likely take a fair amount of time to reach the completion point due to how well this game is designed. With very little direction given in the beginning, it is quite difficult to discern what items must be added to the inventory and how to use obscure items to accomplish all tasks. Some necessary items, such as a post-it note, are disproportionately small and very difficult to spot which works as both a favorable and negative aspect as without this key feature it would take much less time to complete the game. Dialogue tends to be long-winded and often has little to do with the plot which does its part to lengthen play time. On the upside, both commentary and conversations are well-written and voice acting is conducted by a cast of delightful British accents. Background music is equally enjoyable. Overall, if you manage to ignore any outside resource and simply play through the frustration that will inevitably be felt by the lack of direction and the sometimes unapparent activities, the short length of this release will hardly be felt and Apprentice can be truly enjoyable.